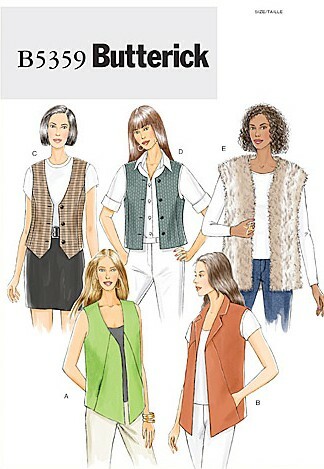 Lined-to-edge vests A, B, C, D, E. A, B: pockets in side front seams. B: collar. C, D: front and back princess seams, front section variations and buttonhole closures. E: extended shoulder seams. Notions description...NOTIONS: Vest C, D: 5/8" Buttons: Three for C and Four for D.
Vest A, B, C, D: Lightweight Linen, Lightweight Broadcloth, Lightweight Tweed and Lightweight Gabardine. Vest E: Fake Fur.